R1234yf (SolsticeTM yf) is a very low GWP (Global Warming Potential) HFO refrigerant gas for the automotive industry, replacing R134a in new car air conditioning systems. What are the features and benefits of R1234yf (SolsticeTM yf)? GWP: 1 (GWP value based on IPCC 5th Assessment). Its use commenced in 2011 and rolled out across all new cars from January 2017. R1234yf has a GWP of less than 1 – that’s 99.9% lower GWP than R134a. R1234yf has an atmospheric life of 11 days compared to a 13 year lifespan for R134a. R1234yf compares in efficiency to R134a and has the same cooling capacity. Vehicles using R1234yf are expected to use less fuel and produce 20-30% less CO2 which means a significantly reduced carbon footprint. R1234yf (SolsticeTM yf) is safe to use. R1234yf has undergone rigorous testing by third parties and car manufacturers, and is verified as safe to use. 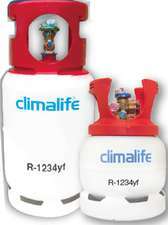 Climalife supply R1234yf to the automotive market in 5kg or 11kg cylinders. R1234yf refrigerant is 100% genuine and conforms to AHRI 700-2016 specifications. It is important to use the right equipment for handling R1234yf. Why choose Climalife for R1234yf? Climalife are a key player in the distribution of car air conditioning refrigerants and other climate control products, with a nationwide distribution network and product knowledge that is second to none. From 2011 the European Mobile Air Conditioning (MAC) Directive prohibited the use of refrigerants with a GWP over 150 in new model type cars. From January 2017, the MAC Directive rolled out this ruling across all new vehicles. With a GWP of less than 1, R1234yf meets the low GWP criteria comfortably and has a very low environmental impact. How many vehicles use R1234yf? Worldwide, sales of cars using the refrigerant R1234yf have steadily increased with more than 44 million vehicles on the road today. In 2017 alone, 2.54 million cars were registered in the UK; every single one of which will be using R1234yf. It’s important for the UK automotive aftermarket to have both products in stock now. How does R1234yf compare to R134a? R1234yf (SolsticeTM yf) is as efficient as R134a, with the same cooling capacity. R1234yf (SolsticeTMyf) uses less fuel, producing 20-30% less CO2 emissions and therefore a significant decrease in carbon footprint when compared to R134a. R1234yf is not a retrofit option for vehicles using R134a. R1234yf has an ASHRAE class A2L which means it’s mildly flammable. It has been extensively tested by third parties and car manufacturers to verify it is safe to use. Where can I download documents on R1234yf? Safety data sheets, technical data sheets, case studies and the R1234yf brochure can be found at the top right of this page.